In 4-quart Dutch oven, melt butter over medium heat. Cook garlic in butter 1 minute, stirring occasionally, until softened. Remove from heat. 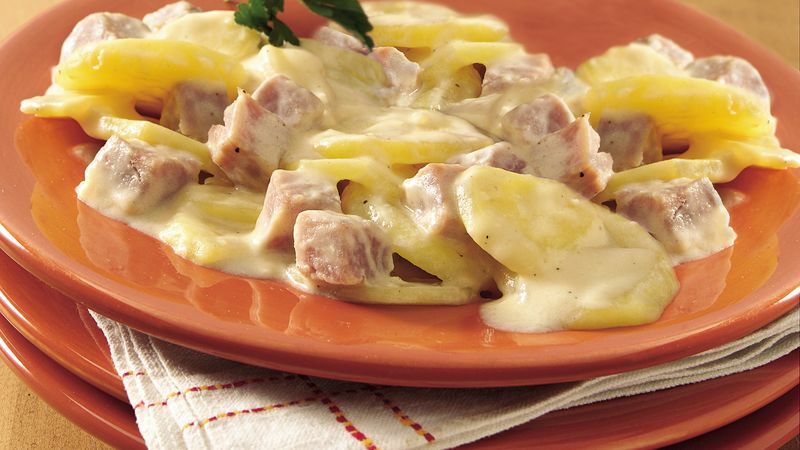 Stir in potatoes, ham, cheese, flour and pepper. Pour half-and-half over potato mixture. Heat to boiling over medium-high heat; reduce heat to low. Cover and simmer about 30 minutes, stirring occasionally, until potatoes are tender. We do not recommend using low-fat or nonfat milk instead of the half-and-half because it can curdle when heated.